Resting metabolic rate refers to the amount of energy needed to maintain respiration, circulation, muscle tone, body temperature, glandular activity and the other functions of the body. This test involves lying supine for about 30 minutes with as little movement as possible. 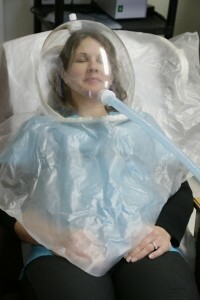 During this time, a clear ventilation hood is placed over the individual’s head which allows for the measurement of carbon dioxide production and oxygen use. Measuring these gases gives valuable information to predict how many calories a person uses at rest to maintain body processes. Both and measured scores are recorded and provided. The person leaves the lab with a more accurate sense of how many calories they need each day and how this changes with exercise level, which can be helpful for those trying to lose, gain, or maintain weight.